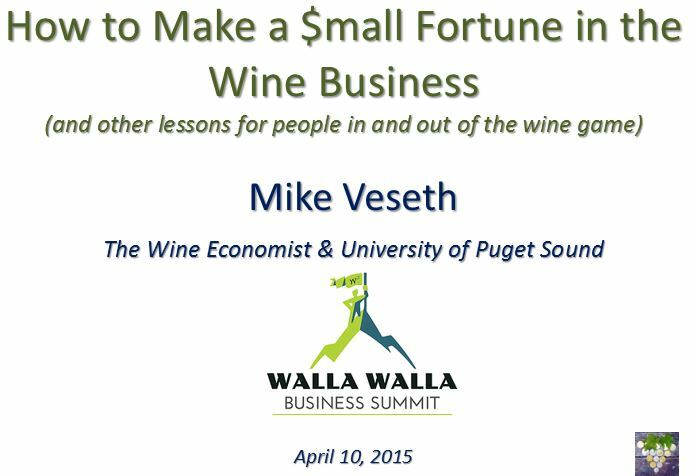 Wine Economist readers in the Pacific Northwest are encouraged to come to the Walla Walla Business Summit at the Marcus Whitman Hotel in Walla Walla this Friday, April 10, 2015. I’ll be joining a solid line-up of business speakers in this day-long event (which concludes with a wine reception, of course). My topic? “How to make a $mall fortune in the wine business (and other lessons for people in and out of the wine game).” I’ll be drawing upon some ideas found in my forthcoming book, Money, Taste and Wine: It’s Complicated! I hope to make my comments relevant to both wine industry people and the general business community. Interested? I look forward to seeing you in Walla Walla. In Australia the conventional answer is to start with a large fortune. No joke perhaps? I think it’s a universal truth (or as close as you can come to it). Reminds me of the old joke about how to make a small fortune in the wine business; start with a large fortune! Keep up the good work. It’s a jungle out there! What time and how much is this event? Also do we need to pre register, if so then where do we do that? Just follow the link that is provided in the story — should have all the information you need. Later any pps/summary/etc for those who will not be there? Eventually, but not immediately. Stay tuned!